They have a body that is well designed to allow them to survive both in the water and on land. Social interaction is a big part of life for the walrus. They are seen in very large numbers on land or on pieces of ice. 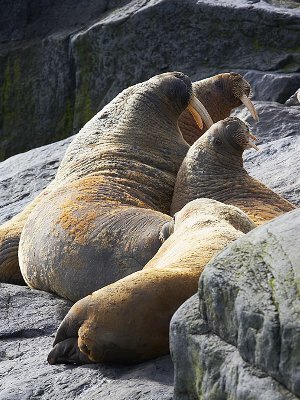 It is believed that anywhere from 20 million to 26 million years ago there were at least 20 different species of walrus. They are opportunistic so they will take advantage of the various types of food that they can find. The walrus has a distribution that includes many places that most people don’t realize they live. The males will become very aggressive with each other during the mating season. The walrus is fascinating, and a big part of their overall survival stems from the great senses and adaptations. The walrus lives in very cold regions, and that has limited their risk factors from natural predators.